June 2016 - Page 2 of 2 - Online Tuition Pakistan, Tutor, Academy Saudi Arabia, Australia USA. 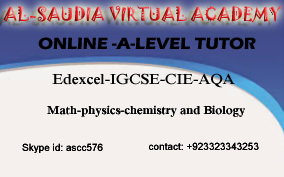 Online Physics Tuition Pakistan, Al-Saudia Virtual Academy, The excellent academy of virtual Tutoring in Pakistan and all around the globe. e-Tutoring, is the leading tutors provider, we have well experienced and dedicated tutors in mathematics, statistics, biology, chemistry and computer. e-Tutor, Al-Saudia Virtual Academy provides excellent and result oriented e-tutors for all curriculum i.e., Edexcel, CIE, MEI, IGCSE, GCSE, CIE, AQA, K 12, American and Canadian curriculum. We are providing excellent tutoring services for decades.